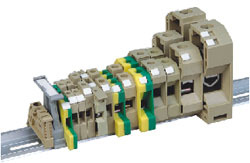 SAK/XB series combined terminal blocks mainly use Germany Woodmeler’s connection technology,and designed and made at home. Technology targets conforms to the standard of IEC 60947-1,IEC60947-7-1,GB14048.1,However,JXB is only for mountin gon increase the high current terminal series. 1. Reasonable installing design,strong versatility,SAKtype can be mounted on the guide of G and TH type. 2. small volume,full specification,series JXB’s big current terminal use reinforced accessories to install steel pressing-wire frame and wire diversion board technology in order to guaranjtee the contact reliable. 3. the stand uses creamed-yellow and grey color,the connexting-grounk pedestal uses yellow and green color with moer modern sense.